Daniel Mastromarino is a member of the class of 2021 at Hobart and William Smith Colleges. He interned here at the Geneva Historical Society this past summer. He researched and shared a short talk on the history of the Sullivan-Clinton Campaign of 1779 at our Rose Hill Through the Ages program on July 21. He previously wrote about the Wyoming Valley Massacre. This is the second post based on his research. Major General John Sullivan led the Continental Army response to Loyalist-Indian incursions along the western New York frontier in 1779. When the American Revolution broke out in 1776, people throughout the colonies were divided on the issue of Independence versus loyalty to the crown of England. Many sided with the Loyalists before the war and promptly joined the British army to crush the American rebellion. One such man was John Butler (1728-1796). Before the American Revolution, Butler served on the side of the British during the French and Indian War as an Indian agent and interpreter. At the start of the Revolution, he recruited Loyalists for the British military at Fort Niagara. Over time, he gathered a group of men who were willing to fight with him. They were commonly known as “Butler’s Rangers.” Butler also worked toward the creation of an alliance with the Native Americans to assist the British cause. Butler was deeply involved with the alliance he had helped to form. He had barracks and storehouses built at the bottom of Seneca Lake, near Kanadesaga, the capital of his Seneca Indian allies. Known as “Butler’s Buildings,” the barracks and storehouses stood on the northwest corner of Seneca Lake, which is the current site of the New York State Welcome Center in Geneva. They served as an encampment and supply depot for the Loyalist-Indian collaboration. The buildings were also an embarkment point for the raids on the frontiers of New York and Pennsylvania; the most notable of which were the attacks on Wyoming Valley, Pennsylvania and Cherry Valley, New York in 1778. One of Butler’s most remarkable feats was his command of the raid on Wyoming Valley. This assault was one of the critical settlement attacks that prompted Washington’s army to act against Butler’s Rangers and the Iroquois Confederacy. 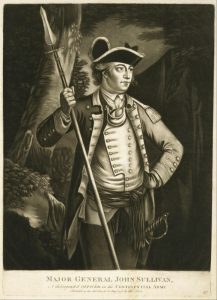 John Butler also commanded Indian-Loyalist forces at the 1779 Battle of Newtown near present-day Elmira during the Continental Army’s campaign into the Iroquois homeland led by Major General John Sullivan (1740-1795). Following his victory at Newtown, Butler’s Buildings became a primary target for General Sullivan’s campaign. His army approached the buildings with caution, and reconnaissance teams were sent to detect an enemy presence in the area. When the American troops arrived at the premises, they found the buildings utterly deserted, and no one was in the area. The buildings were abandoned because the Indian-Loyalist alliance had disintegrated after the defeat at the Battle of Newtown. The Loyalists had fled to Canada with many of their Iroquois allies. Sullivan’s troops burned Butler’s Buildings, along with an adjacent cornfield. John Butler and his Loyalist Rangers’ efforts to crush the rebellion against the crown were thwarted by General John Sullivan’s “scorched earth” campaign. The campaign resulted in the burning of dozens of homes and Indian settlements in the region. Also, thousands of bushels of corn and other crops were destroyed, thus depriving the Native Americans of their homes, their political power, and an independent future in central New York. G. David Brumberg. The Making of an Upstate Community: Geneva, New York. W. F. Humphrey Press. Geneva, NY, 1976. Thomas E. Byrne, Editor. Sullivan-Clinton Campaign 1779-1979: A Bicentennial Commemorative. Sullivan-Clinton ‘79. Elmira, NY, 1979. George S. Conover, Editor. History of Ontario County New-York. D. Mason & Co., Publishers. Syracuse NY, 1893. Peter Eisenstadt, Editor. The Encyclopedia of New York State. Syracuse University Press. Syracuse NY, 2005. David M. Ellis & Sherri Goldstein Cash. New York State Gateway to America: An Illustrated History. American Historical Press, 2008. Laurence M. Hauptman. Conspiracy of Interests: Iroquois Dispossession and the Rise of New York State. Syracuse University Press. Syracuse NY, 1999. Milton M. Klein, Editor. The Empire State: A History of New York. Cornell University Press. Ithaca and London, 2001. Anthony F. C. Wallace. The Death and Rebirth of the Seneca. Vintage Books. New York, NY, 1969.